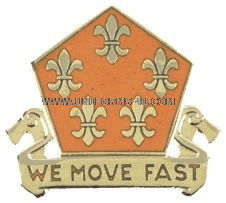 The 5th Signal Battalion Distinctive Unit Insignia (unit crest) is crafted in orange and white; orange has been a Signal Corps branch color since 1872, while white was added as secondary color to reflect the Corps’ status as a non-line branch (line branches always have a single color). Five fleur-de-lis symbolize the Battalion’s service in France with the 5th Division (later designated the 5th Infantry Division) during the First and Second World Wars. World War I campaign credits include St. Mihiel, Meuse-Argonne, Alsace 1918, and Lorraine; WWII campaigns were Normandy, Northern France, Rhineland, Ardennes-Alsace, and Central Europe. “We Move Fast,” the Battalion motto, is inscribed on a scroll beneath the five-sided shield, which is a reference to the unit’s numerical designation. The 5th Signal Battalion underwent a series of sporadic activations and inactivations following World War II, with its last period of active service beginning in 1975 and ending with the unit’s final inactivation on 16 December 1992 at Fort Hood in Texas.